Earlier this month, we discussed how the President’s campaign arm – Obama For America (OFA) – was still calling for supporters to make donations. We had a few people write in and say that this is usually done to clear up any residual debts the campaign may have accrued. Well, the debt must really be bad for the folks at OFA to stoop this low. Chief campaign adviser David Axelrod sent out an e-mail late Monday night, which discusses the mass shooting in Connecticut and includes a clip of the President’s speech to the residents of Newtown. The letter then provides readers with a link to the OFA website, where they are inundated with two separate donation options – ‘Donate’ or ‘Quick donate’. Obama for America sent an email Monday night from David Axelrod promoting President Barack Obama’s speech to families in Newtown, Conn., following the fatal shootings at the Sandy Hook School. A link in the email to a video of the speech led to the campaign website, featuring two buttons for financial donations. Axelrod did not ask for donations in the email itself. The Web page included a “Donate” button at the top and a second “Quick donate” button asking for $5. They won the campaign handily and even had $14.2 million to spare, but the Obama-Biden campaign is still raising money, this time off the president’s comments about the Sandy Hook Elementary School shootings in Connecticut. 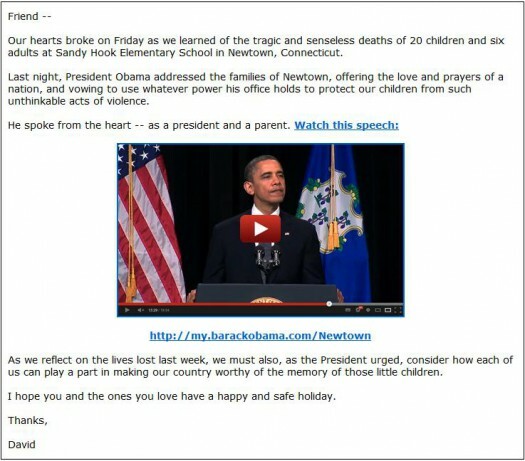 In email from chief campaign advisor David Axelrod that urges supporters to watch President Obama’s moving address to the community of Newtown, Conn., there are two links that open a page with a video player featuring the president’s speech and two donate buttons asking for $15-$1,000 for his campaign. “The next chapter begins today. Stand with President Obama for the next four years,” headlines the donation page. The buttons are clearly part of the template design of the site, and I’m quite sure that a link to any story at OFA would reveal the donation buttons. But why bother putting a link to the campaign site in an e-mail of that nature in the first place? Embedding the video with no links would have been far more tasteful and less controversial. Previous post Is This Video of A Golden Eagle Snatching a Baby Real?